The Git Database API gives you access to read and write raw Git objects to your Git database on GitHub and to list and update your references (branch heads and tags). This basically allows you to reimplement a lot of Git functionality over our API - by creating raw objects directly into the database and updating branch references you could technically do just about anything that Git can do without having Git installed. Git Database API functions will return a 409 Conflict if the Git repository is empty or unavailable. An unavailable repository typically means GitHub is in the process of creating the repository. For an empty repository, you can use the Create a file endpoint to create content and initialize the repository so you can use the Git Database API. Contact GitHub Support if this response status persists. 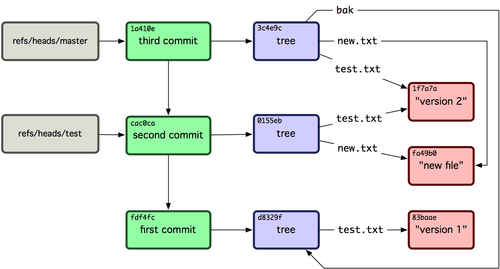 For more information on the Git object database, please read the Git Internals chapter of the Pro Git book. It might seem complex, but it's actually pretty simple when you understand the model and it opens up a ton of things you could potentially do with the API. Warning! Please do not depend on using Git directly or GET /repos/:owner/:repo/git/refs/:ref for updates to merge Git refs, because this content becomes outdated without warning. A consuming API needs to explicitly request a pull request to create a test merge commit. A test merge commit is created when you view the pull request in the UI and the "Merge" button is displayed, or when you get, create, or edit a pull request using the REST API. Without this request, the merge Git refs will fall out of date until the next time someone views the pull request. Receive the pull request webhook. Call GET /repos/:owner/:repo/pulls/:pull_number to start background job for creating the merge commit candidate. Poll your repository using GET /repos/:owner/:repo/pulls/:pull_number to see if the mergeable attribute is true or false. You can use Git directly or GET /repos/:owner/:repo/git/refs/:ref for updates to merge Git refs only after performing the previous steps.